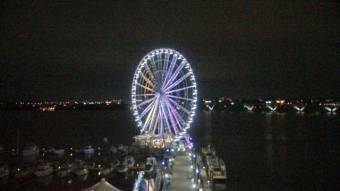 It's 22:54 in National Harbor, USA right now. National Harbor A webcam in National Harbor, Maryland - camera location: National Harbor. Alexandria, Virginia: Torpedo Factory Art Center, 2.3 miles away. Alexandria, Virginia: Belle Haven Country Club, 2.3 miles away. Morningside, Maryland: Morningside Weathercam, 7.1 miles away. Washington D.C., District of Columbia: Walker Jones R H Terrell EC, 7.4 miles away. Washington D.C., District of Columbia: Livestream Capitol, 7.4 miles away. Arlington, Virginia: WJLA-TV, 8.4 miles away. Springfield, Virginia: Washington Irving Middle School, 9.5 miles away. McLean, Virginia: Langley School, 13.6 miles away.